George puts out the call for help, Mo talks about the latest addition to the MCU, and Jon is in love with an accessory for his new Galaxy S10+! In this week’s episode, we look at how our lives were different growing up as GenX’ers and how the way we communicated affected our lives. How did we survive? We did — pretty well actually. In this week’s episode, George invests in some audio equipment he hopes his wife doesn’t find out about, Jon plays a game that doesn’t let him down, and Mo talks about a really dull tech toy. 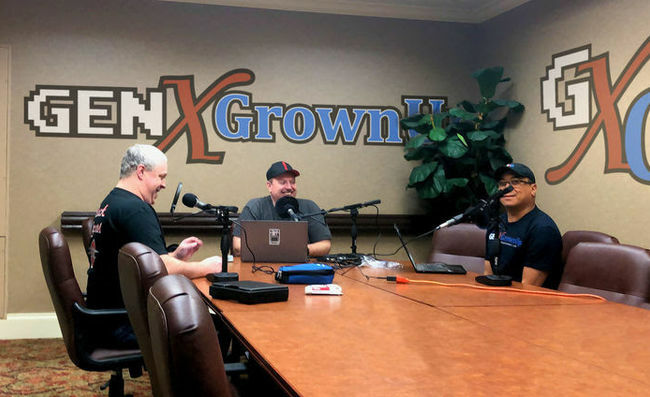 GenXGrownUp was in attendance at Pensacon 2019 in Pensacola, Florida. After a full day of taking in the sights & sounds at the Bay Center, Jon, George, & Mo gathered around a microphone in the hotel for a first-ever live streamed podcast episode. In this Backtrack we remember some of our favorites and talk about what made them so memorable. Jon, George, and Mo all have shows you need to watch, after years (literally) of delays Jon is finally getting a much-anticipated video game sequel, George brags about his incredible high score, and Mo is jealous of George’s incredible high score. In this Special Edition podcast, we’ve scoured every episode to find anything we were looking forward to that sort of dropped off the radar and we didn’t talk about it again. Back in the ’70s and ’80s, when you only had original programming on three channels (PBS didn’t count), there was a dark thing called “reruns.” This was when all the new shows were just repeated week after week while we waited for the new season to arrive. But there was a bright light in the darkness called Battle of the Network Stars! In this episode we look back at the snacks & candies we remember growing up that have gone the way of the dinosaurs, and some for very good reasons! If you have forgotten favorites that we missed, let us know! This week, Jon talks about his road rage, Mo is excited about a new update to an older game and George is having some family bonding through an updated edition of a classic video game! In this week's podcast we think back on the days of record stores, records, tapes, and how they influenced our lives. George wonders, "Is watching a movie on an Oculus Go with other people in the room rude?" Mo wonders, "What can I build to justify owning a 3D printer?" And Jon has the deepest thought of us all, "Can Holmes and Watson really be that bad?" These and other meta-physical thoughts are discussed on this week's podcast! In this episode we talk about our first time using computers to access a larger world! Back in the 80’s Bob Geldof, a singer and activist, started Band Aid to raise money for famine relief in Ethiopia. Whether it was intentional or not, that started a wave of celebrity activism which raised millions for various causes and created a few number one music hits as well. This week Mo finds another disappointing game, Jon tells us of a documentary that dissects one of the most famous movie scenes in history, and George finds something cool while cleaning off his desk! In this episode we talk about some of the unique songs and unique methods of how we got them. Remember, no internet back then, we actually got records in cereal boxes if you can believe that! George tells us why he thinks Room 104 needs another look, Mo has a non-opinion on Fallout 76 and Jon forces himself to talk about something not Wreck it Ralph related by telling us about his early excursions into the world of Dash Cams. In this backtrack we talk about the experience of the arcade: from scrounging for quarters under seat cushions to how we chose which games to play. You would never believe this but Jon is still talking about Wreck it Ralph 2! When we do get a word in edgewise, George gives us a surprising update on the #NOFILTER interactive game and Mo talks about the new video game based on Call of Cthulhu. In episode 32 of the GenGrownUp Podcast, Jon is still going on about yet﻿ another sequel that’s coming out, Mo finally sees some light with ﻿TellTale’s Walking Dead game, and George gives his opinion of the first ﻿weeks of the #NOFILTER interactive game. In this Backtrack ﻿we look at what we thought the future would hold and discuss some of the﻿things we thought we would have and don’t, and what we have that we ﻿never would have predicted. In this episode, Jon explains how he burned his retinas, George tells us about a game (or is it just a game? ), and Mo finds an app that solves a problem nobody knew existed. This week's Backtrack Topic all about Radio Shack! Any GenX'er who was into anything electronic will have a story about visiting a Radio Shack. They were the place to go when you needed a hard to find part or when you wanted to speak with some knowledgeable people about CB radios, computers or anything that used electricity. We had shoe boxes full of ﻿baseball cards and our binders were covered with Wacky Packs and Garbage﻿ Pail Kids stickers. In this episode we talk about our experiences with ﻿collectable cards growing up and even do a little research into the ﻿history! In this week’s GenXGrownUp Backtrack we ﻿remember playing outside. Sometimes because we wanted to and sometimes ﻿because our parents banned us from the house! This week, we all admit to crying while watching a movie, George ﻿vehemently defends a TV show, Jon gives his feeling on using retro game ﻿ROMs and Mo finds a site that talks about the failed comic book heroes ﻿and villains! In honor of back to school time we take a look back on things we remember from going back to school after summer vacation. On the date of the one-year anniversary of the launch of our podcast, we offer this special edition release.Audio quality and editing are sub-par, but if you're a fan of the show, you might get a smile or two listening to the origin of what has become an important part of the GenXGrownUp media empire! In this episode, George finds a great resource for the comic book folk, Jon introduces us to both a PC and mobile game, and Mo sees The Meg. Do you remember making mad dashes to the video store at 2am to avoid paying late fees? Join us as we talk about the experience of the movie rental store and how it was a major part of the lives of GenX'ers. This week, Jon bravely admits that he is looking forward to "The Meg," Mo is confused about whether or not he liked "Batman Ninja," and George talks about two great streaming shows: one new and one returning. Today most of us walk around with hundreds of gigabytes of storage in our pockets and think nothing of it. Listen to how we survived those days and how much things have changed in just a couple of decades. George talks about the great shows he's discovering on streaming, Mo vehemently warns off the listeners from what he sees as a Netflix train wreck and Jon solves some crazy cube puzzles. Probably the magazine that was in more homes than any other was the TV Guide. Back in the days of our GenX youth, it was the only way to see what'll be coming on so you could properly plan your TV watching! Listen to us discuss how this small format, weekly magazine influenced not just our TV watching, but our home lives as well! This week, Jon brags about his amazing cubing skills, Mo finds a helpful site for navigating Amazon reviews, and George talks about some of the great shows returning to streaming services! A few weeks ago we met up with Mitchell at the Southern-Fried Gaming Expo for a quick interview where his answers to our questions were somewhat vague.Our viewers demanded more detail and specificity, so we followed up with Mitchell. In this episode Mo gets Jon and George interested in two new games from the makers of Life is Strange, Jon gets Mo and George to buy yet another toy we don't need and George listens to Mo and Jon talk about the movies he's missed! In this episode we look back on Schoolhouse Rock and how we all learned the preamble and many other things because of it! Jon and Mo are forced to admit that George won our Spring movie blockbuster wager (and of course George was the picture of grace and dignity about it). On top of that, Mo talks about Solo, Jon recommends a game whose purpose is to sometimes do the wrong thing, and George thinks back on the Rubik's Cube. Listen to Solo, Atari VCS, & Dude Stop! We do our best to cover this vast topic on the fads we most remember growing up in the 70's, 80's and 90's. So whip out the boom box and some cardboard and let's break dance! We talk about Deadpool 2, lament over the possibility of Timeless getting cancelled, and Jon discovers something that most of us have known for years! Listen as we reminisce (and lament!) over what we had to go through in order to capture that perfect memory! We have to talk about Infinity War of course, but also in this episode; George talks about Cobra Kai, Jon give his opinion of the new season of WestWorld (which George does not agree with) and Mo talks about two old school strategy board games that are given a modern update. Pretty much everybody knows who Ellen is, along with Roseanne, Jerry Seinfeld, Robin Williams, and Eddie Murphy. But did you know they all got their start back in the 70's and 80's? We talk about them and other comedians that we remember, plus we have special guest, Kevin Gootee. 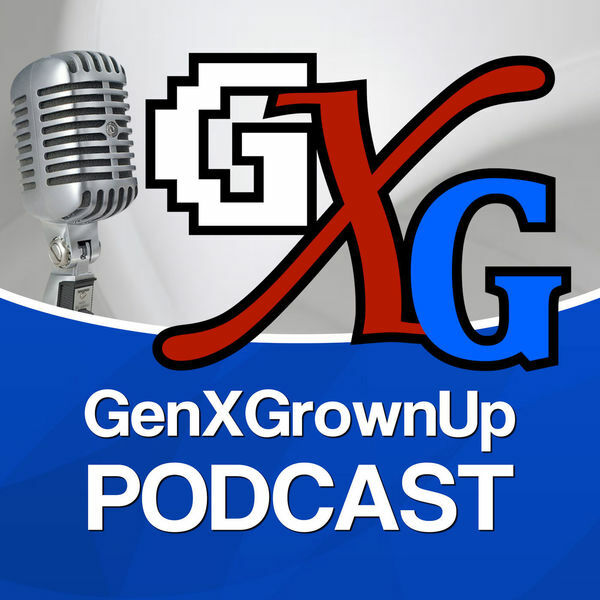 In this installment of the GenXGrownUp Podcast, Mo is underwhelmed by a video game, Jon finds yet another great show for us to get hooked on and George goes to back-to-back comic book conventions! In this episode, we talk about some of the movies that scared the crap out of us when we were kids and why we liked them! We were still working out the kinks of our new audio system so please bear with us and we will be up to our usual high standards soon! In this episode, George gets some new lights, Mo looks forward to yet another game-based movie, and Jon looks for an opportunity to use his new toy! Plus, with the release of Ready Player One, keep up with how we are doing with our Movie Battle Royale! In this episode, we talk about the Walkman's history and our personal experiences with this life changing piece of tech. We discuss the return of the Timeless TV show, the new Tomb Raider movie and how awesome Humble Bundle can be! As usual, all this and more! Take a listen as we ﻿recount our experiences with this iconic theme park and how it has ﻿changed over the years. Jon talks about the best ﻿arcade game he’s played on a mobile device, Mo chimes in on the second ﻿season of Jessica Jones, and George explains why something called ﻿QuadHands has five hands! Listen to us reminisce about the shows we watched and loved as kids and let us know the ones we missed! So back in a GenXer’s younger days, we knew the value of a good ﻿education. The first thing we did when we got home was study and do our ﻿homework……. BWA-HA-HA-HA! Sorry, I couldn’t keep a straight face with ﻿that one. Are you kidding?! We would do anything but our homework! Part of our distraction was the afternoon TV targeting us as kids. And we were powerless…. Listening to music was a different experience when we were kids. DJs ﻿were local, you had to wait to hear your favorite song, and trying to ﻿record something off the radio took skill, patience and luck! Listen as ﻿we talk about the local radio experience and we would love for you to ﻿share some of your own! In lucky episode thirteen we talk about everything from the latest "twist" in Star Trek Discovery (no major spoilers), an old superhero show that only lasted two seasons, and a great new game that is coming out in a couple of weeks! How many times have we spoken those ﻿words to our parents on those long car trips? How in the world did we ﻿survive those trips without DVD players, phones and Game Boys? Well, in ﻿this episode we look at the things that helped keep our parents from ﻿killing us. Stop touching me! The long-awaited return of George to the podcast means another drone ﻿update! But that’s not all. Other George-welcoming topics on the docket ﻿include Mo’s decision to stay on the dark side, an old game gets new ﻿life with some clever mods, loot-box Steam games are finally going to ﻿get their due, and we take a trip to an epic video game museum. Who remembers playing games like ﻿Mouse Trap and Uncle Wiggly? We do! In this episode we look back at the ﻿ones that we know, and sometimes love. In this episode, Jon starts down the path of appearing on “Hoarders” when he comes across a “few” classic video games at a flea market, Mo laments over getting a great Christmas gift, and we are joined once again by our good friend Emceemur who costs Jon and Mo more money and frustration by introducing them to a new game! Come along for the sleigh ride as Mo, Jon, and guest host Emceemur remind you of the reason for the season: stop motion animation and cartoons! Fast food is the same now as it's always been... or is it? We delve deep into our memories of the fast food experience and explore how much grabbing a quick burger an fries has changed over the years. In this Backtrack, we talk about the computer games we loved to play growing up, the machines we played them on, and what made them so special to us! In this installment of the GenXGrownUp Podcast, we talk about how Justice League is in our top 4 DC movies, a raunchy new sci-fi comedy on Hulu, flea market finds which will likely drive Jon crazy trying to get them in working order, and we put pressure on George to get his racing drone up in the air. In this Backtrack we discuss the importance of breakfast cereal to a young GenX'er, our favorite brands, and the rules & struggles of getting our hands on that free prize inside the box! In this week's show we talk about Jon's cheating skill at beating his friends in Nidhogg 2, our impressions of Stranger Things 2, and what we think of the latest addition to the movie experience: D-Box motorized theater seats! This week's backtrack topic is those most wonderful of clicky communication devices; the rotary phone! Time to backtrack again. This week's topic: action figures! Join us as we Backtrack to the 70s and reminisce about the first video game consoles we owned. This week we talk about George's experience diving into podcast listening. Further topics include Defenders, Death Note, Logan Lucky, Arcade Classics, Prey and Ticket to Ride.